I thoroughly enjoy reading Lucy’s blog posts, always amusing and always informative, so when Lucy started her tree following project and asked if anyone else had a tree they wanted to follow, I immediately knew it was time to expose a very special sapling to the big bad world of twitter. Why, you may ask, is this rather straggly and somewhat insignificant and immature tree so important? Well for two reasons; when my first son was born, I followed the NCT regime of raising a healthy and nutritionally perfect child. Liquidised sweet potato, carrot, broccoli and I am particularly proud of his first Christmas when he ate a Brussels Sprout…no joke! 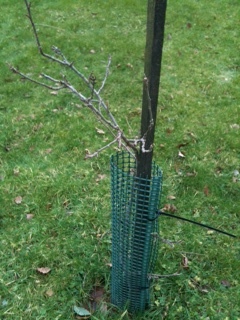 So when he ate his very first apple, an organic Royal Gala, I marked the occasion by planting the pips from said apple. He would have been around 2 years old. I recall it was quite an occasion placing the precious pips in the pot. Everyday thereafter he would check it to see if anything had emerged from the brown soil and he dutifully watered and cared for it. Eventually a tiny green shoot appeared and we were careful not to disturb it when removing the weeds that had also started to germinate successfully. Three weeks before his 3rd birthday he was on a life support machine following open heart surgery. 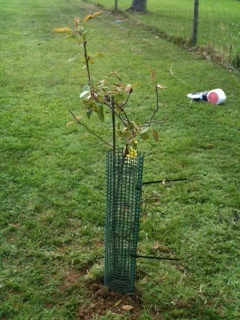 That is another story, because the purpose of this post is to follow his tree and I can tell you that against the odds, not only did my son make a remarkable recovery that surprised everyone, and is now a strapping teenager, but the apple tree, that remained in the same pot we put it in over 10 years ago, was finally transplanted last autumn into the terra firma. It was no doubt a traumatic moment for it, after such a long time we wondered if it would be pot-bound (we had to carefully tease the roots out of their matted tangle) and feared the worst when the storms hit in early 2014. But I staked it well and protected it from nibbling deer with a sleeve. It is now showing signs of some fresh buds and shoots, they are so very tiny and delicate, but I am keeping my fingers crossed that before much longer it may start to leaf-up. Oh…and the other reason the little sapling is special? According to the Bridport Community Apple Orchard lady who came to visit, it is very unusual to grow an apple tree successfully from a pip. But like my son, it is clearly resilient and very strong, determined to make it against the odds and one day I am sure it too will grow into a strapping adult apple tree! This entry was posted in Tree Following and tagged apple, apple tree, garden, lucy corrander, sapling, seed, tree, tree following project. Bookmark the permalink. Clearly a very, very special tree – and a glimpse into the hard things in your own life too. Seeing its leaves and blossom reappear each year must lift your heart wonderfully. 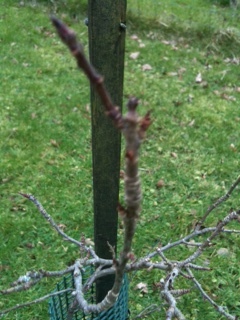 It certainly is a special tree Lucy, I am longing for the day when it is big enough to produce apples! Lovely story about how your tree came to be growing. I’m sure it will be doing really well this year. I’m glad you enjoyed it, I hope it will continue to do well for many years to come. Hello Frances, thank you for your comments. It was quite nerve wracking planting it in the garden, but so far so good! I’m glad you enjoyed the story of how our little sapling came to be, thank you for commenting. Sophia, what a fantastic tree to follow: it sounds as though you have been following it for a while now! Glad to hear your son is now a strapping teenager! What a wonderful story, my heart sank at one point, so I am glad you now have a strapping teenager, maybe his children will eat apples from the tree and listen to its story. I will enjoy seeing it grow through the year, very much. Thank you Janet, I hadn’t thought of the future of the tree in that regard, but I rather like the idea. What a great story about a very special tree. Maybe it will produce special apples too. You will have a brand new variety that you can name after your son. Thank you, I’m glad you enjoyed reading about our special sapling. I like your idea of naming the variety after my son!